A $1 billion deal to save Indonesia’s rainforests has slowed a “tidal wave” of logging destruction, Greenpeace’s global chief said Monday, but he warned much more needed to be done. 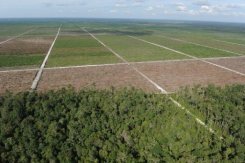 The remaining rainforest treeline next to a newly developed palm oil plantatio in Central Kalimantan province on June 7, 2012. A $1 billion deal to save Indonesia’s rainforests has slowed a “tidal wave” of logging destruction, Greenpeace’s global chief said, but he warned much more needed to be done. While many environmentalists have sharply criticised Indonesian efforts to end rampant logging across some of the planet’s most vital forests, Greenpeace International executive director Kumi Naidoo said there was reason to hope. “Firstly, we must acknowledge with shame and with sadness how much has been lost. How much biodiversity has been lost… it was like a non-stop tidal wave,” Naidoo told AFP in Manila while on a short Southeast Asia tour. Naidoo said a key plank of conservation efforts was a deal brokered through the United Nations climate change negotiations for Norway to pay Indonesia $1 billion to protect its remaining rainforests and peatland. As part of that deal, Indonesian President President Susilo Bambang Yudhoyono placed a moratorium two years ago on issuing new logging permits for virgin rainforests, which was this month extended for another two years. But many green activists, including Greenpeace campaigners in Indonesia, have said huge areas continue to be logged because of widespread corruption and many loopholes in the moratorium. Indonesia’s carbon-rich rainforests and peatlands have for decades been wiped out to extract the timber as well as to clear the land for palm oil plantations and mining activities. 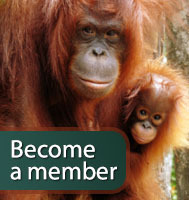 Indonesia is the world’s top producer of palm oil, which is used for many everyday items such as soap and biscuits. The destruction has ravaged biodiversity — placing animals such as orangutans and Sumatran tigers in danger of extinction — while also leading to the release of vast amounts of climate change-causing carbon dioxide. As a result, Indonesia has the third biggest https://www.chapelvalley.com/, after China and the United States. Naidoo said he agreed that the moratorium had not ended logging and Indonesia’s rainforests continued to be among the most vulnerable in the world. “The global reality is that every two seconds a forest the size of a football field is disappearing,” he said. But he said the moratorium had helped to lay foundations for an end to logging, and the Indonesia-Norway concept should be built on elsewhere around the world. “The moratorium in Indonesia is not perfect (but) it actually offers promise as a model… just the fact the moratorium was called raised public awareness in Indonesia in a very positive way,” he said. Naidoo also said the moratorium had created a “legitimate space of intervention for Indonesian civil society”, so that activists could drive further reforms. Critics of the moratorium often cite the fact that it does not include secondary forests, and that permits already given for concessions in virgin areas can still go ahead. There are concerns a plan to open up an area of rainforest around the size of Cyprus for development in Aceh on Sumatra island could be approved soon, despite the moratorium. Greenpeace has called for the moratorium to be strengthened to remove the loopholes. Norway has so far only handed over a tiny sum of the pledged $1 billion, because the deal is performance based. Indonesia on right path to saving forests: Greenpeace | Bangkok Post: news.